Christian Fiesel is not a new name in the field of EM. Inspired by the retro Berlin School, and these atmospheres which passed in transit between our ears with vapors of ether, as well as Krautrock in a more experimental way, he has released nearly 20 albums where the noise and the dissonance of the sounds went hand in hand. His approach of composition changed radically when he bought a Mellotron in 2015. From strange and bizarre, his music became more accessible for the kind of horror and science fiction movies. This is how he joined the label Aural Films and has cosigned works of obscures and tenebrous film or ambient music with the famous Wolfgang Barkowski (Alien Nature) and 3 others for movies purposes with the very famous Jack Hertz, big composer of theme music in the states. A contact from Hagen von Bergen, owner of the German Bi-Za Records label, opened the doors for the making of “Hagen's Delight”, a title which depicts all the affection of Hagen von Bergen for the music of Christian Fiesel. I was knocked down by this album of which the music was written between 2014 and 2016. Autopsy of an album where the Mellotron carries us into a magical universe of fright! The first thing which seduces me with "Bell's Call" is this odd sensation to penetrate into the lugubrious ambience of The Keep with a dense and a very dark ambiospherical veil where luciferian voices hum. These ambiences are weaved from mist oozing of a brownish drizzle and from lamentations of a guitar loaded of vampiric harmonies. The keys which ring in this glaucous decoration add a well felt touch of nostalgia. Christian Fiesel uses no sequencer and that's why his patterns of rhythms are surprisingly mesmerizing, as in "Darkness Rising" and its multiple oscillating loops which rise and fall with very nice nuance in the tone and in the pace. The whole thing is carefully wrapped of chthonian voices and with a paranormal atmosphere. I have the impression to hear Tomita in a Japanese horror drama. It's very good and that starts “Hagen's Delight” on the right foot! "Nightprogram" carries well enough its naming! A strange and enchanting beating creates a felted rhythmic but all the same rather hypnotic. Clouds move with bits of chant in the drizzle and are fill of a murky mood. This fusion of synths and Mellotron is a formidable weapon in this album. And it gives a so sibylline effect as our senses remain nailed to this fascinating occult air which espouses an amplified tangent in the middle with effects of distortions and chants of ectoplasms eager to invade us. Keen oscillatory movements establish a rhythmic cacophonous which does very experimental years of EM for a seducing 3 minutes' time. And there, it's getting so obvious, I have this feeling that Kraftwerk and its Radioland invades the sound space of “Hagen's Delight”. Up to here, I am totally under the charm. "Out of the Spheres" propose a structure of rhythm in the shape of Spirograph race among which the tones and the cracklings form a circular sound web, while the remote structures of rhythm in "Rusty Nail" gets out of breath in a dense magma of sounds and of sepulchral effects. "Say Goodbye to Yesterday" proposes a very beautiful introduction cut out in the charms of the Mellotron. Layers of old organ, murmurs of chthonian incantation and fluty harmonies float as an funeral cloud up to the doors of the fifth minute. Heavy percussions hammer a slow rhythm which progresses with difficulty through those many sound effects. Christian Fiesel imagines in music the difficult procession of a caravan and it’s quite a success. An explosive and creative title? "Don't Surrender to Hate" will seduce the fans of ['ramp] with a splendid rhythmic pattern built in Dance Music mode played with a small delay in the echo. Inserted here makes this short title simply magical. "The Long Cure" is a long and very ambiospherical title with some tumults which shake by moments its peace of mind. The ambiences are more translucent than totally dark with hollow breezes, chthonian choir and a long passage, as well as the final, more ethereal. 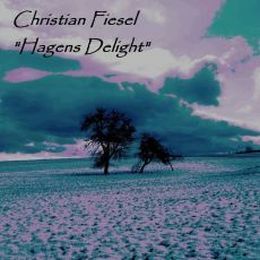 "Downwards we Go" reflects quite well Christian Fiesel's gloomy cinematographic vision which feeds the 2nd CD of “Hagen's Delight”. The synthesist from Hamburg plays brilliantly well inside his ambient phases by crumbling a rambling structure of rhythm which disintegrates its fragments in a rather psychotronic 1st part, while the last 9 minutes of "Downwards we Go" get evaporate in a good moment of contemplative sweetness. "Desert Trail" stands out with its acoustic guitar which tries to scratch a melody in sound effects and in synth layers with flavors of trumpets which do very TD. Tangerine Dream that we were able to notice the influences also in "Downwards we Go". "After Dallas" does very Steve Roach, while the short "Shielded Transformer" does very atmospheres of horror movie where the end of the world gets in with its troop of starving evil spirits. "Wisdom" presents a violent storm of winds as dark as shrill and among which both tones are in confrontation in a hullabaloo duel. Are those the warning trumpets of the angels of apocalypse? The fact remains that we have the feeling to fall in the hollow of the Earth with noises of a sonic marginality as disturbing as attractive. "Wisdom" goes by in several phases. So, if the impression to emerge from the darkness in order to be caressed by warm harmonious winds calms down our feelings, it's to dive back again into a spiral, as a purgatory, where the din gets alive again and lead us even farther in the blackness. Two short titles separate our ears of this first listening of “Hagen's Delight”. "Glass Cabinett" is a very disturbing title perfect for a horror movie with grueling images It's sordid to the bone! "A Summer's Funeral" is a wonderful track. A lot of delicacy in spite of its mortuary envelope, the title offers a suite of arpeggios which skip with a melodious approach which melts into an embalmers' choir. It's very good and rather incentive to put back CD 1 of “Hagen's Delight” in the CD player. Here's a great surprise! A surprising album which will undoubtedly please to the fans of a Berlin School of the unimaginable years. Christian Fiesel n'est pas un nouveau nom dans le domaine de la MÉ. Inspiré par le Berlin School rétro, et ces ambiances qui transitaient entre nos oreilles avec des vapeurs d'éther, ainsi que le Krautrock plus expérimental, il a composé plus d'une vingtaine d'albums où le bruit et la dissonance des sons allaient de pair. Son approche de composition changea radicalement lorsqu'il se procura un Mellotron en 2015. De bizarre sa musique devint plus accessible pour le genre film d'horreur et de science-fiction. C'est ainsi qu'il a joint le label Aural Films pour cosigner des œuvres de musique cinématographique pour films sombres et noirs avec le célèbre Wolfgang Barkowski (Alien Nature) et 3 avec le très renommé Jack Hertz, grand compositeur de musique de film aux USA. Un contact avec Hagen von Bergen, propriétaire du label Allemand Bi-Za Records ouvrit les portes pour la réalisation de “Hagen's Delight”, un titre qui dépeint toute l'affection de Hagen von Bergen pour la musique de Christian Fiesel. J'ai été renversé par cet album dont la musique fut écrite entre 2014 et 2016. Autopsie d'un album où le Mellotron nous entraîne dans un féérique univers de peur! La première chose qui me séduit avec "Bell's Call" est cette étrange sensation de pénétrer la lugubre ambiance de The Keep avec un dense voile ambiosphérique très ténébreux où fredonnent des voix lucifériennes. Les ambiances sont tissées de brouillard suintant d'une bruine brunâtre et de lamentations d'une guitare aux harmonies vampiriques. Les accords qui tintent dans ce décor glauque ajoute une touche de nostalgie bien sentie. Christian Fiesel n'utilise aucun séquenceur et c'est pourquoi ses figures de rythmes sont étonnement envoutantes, comme dans "Darkness Rising" et ses multiples boucles oscillatrice qui montent et descendent avec très bonne nuance dans le ton et la cadence. Le tout est soigneusement enveloppé de voix chtoniennes et d'une ambiance paranormale. J'ai comme l'impression d'entendre du Tomita dans un drame d'horreur japonais. C'est très bon et ça démarre bien “Hagen's Delight”! "Nightprogram" porte assez bien son appellation! Un étrange et ensorcelant battement instaure une rythmique feutrée mais tout de même assez hypnotique. Les nuages se déplacent avec des chants dans la bruine et imprègnent une sordide ambiance. Cette fusion des synthés et Mellotron est une arme redoutable dans cet album. Et cela donne un effet si sibyllin que nos sens restent cloués à ce fascinant chant occulte qui épouse une tangente amplifiée en mi-parcours avec des effets de distorsions et des chants d'ectoplasmes pressés de nous envahir. De vifs mouvements oscillatoires instaurent une rythmique cacophonique qui fait très années expérimentales de la MÉ pour un séduisant 3 minutes. Et là, c'est tellement évident, j'ai cette impression que Kraftwerk et son Radioland envahit l'espace sonore de “Hagen's Delight”. Jusqu'ici, je suis totalement sous ensorcèlement. "Out of the Spheres" propose une structure de rythme en forme de spirographe dont les tons et les grésillements forment une toile sonique circulaire alors que la lointaine structure de rythme dans "Rusty Nail" s'essouffle dans un dense magma de sons et d'effets sépulcraux. "Say Goodbye to Yesterday" propose une très belle introduction découpée dans les charmes du Mellotron. Des nappes de vieil orgue, des murmures d'incantation chthoniennes et des harmonies flûtées flottent comme des nuages obituaires jusqu'aux portes des 5 minutes. Des percussions lourdes martèlent un rythme lent qui progresse avec peine à travers moult effets sonores. Christian Fiesel imagine en musique la difficile procession d'une caravane et c'est assez réussi. Un titre explosif et créatif? "Don't Surrender to Hate" va séduire les fans de Ramp et autres avec un splendide jeu de rythme construit en mode Dance Music joué avec un léger décale dans l'écho. Inséré ici rend cette courte pièce tout simplement magique. "The Long Cure" est un long titre très ambiosphérique avec quelques tumultes qui secouent par moment sa quiétude. Les ambiances sont plus translucides que totalement obscures avec des brises creuses, une chorale chtonienne et un long passage, ainsi qu'une finale, plus éthérée. "Downwards we Go" reflète assez bien la vision cinématographique obituaire de Christian Fiesel qui nourrit le 2ième CD de “Hagen's Delight”. Le synthésiste natif d'Hambourg joue merveilleusement bien à l'intérieur de ses ambiances en émiettant une structure de rythme décousue qui désagrège ses fragments dans une 1ière partie assez psychotronique, alors que les 9 dernières minutes de "Downwards we Go" s'évaporent dans un bon moment de douceur contemplative. "Desert Trail" sort du lot avec sa guitare acoustique qui tente de gratter une mélodie dans des effets sonores et des nappes à saveurs de trompettes qui font très TD. Un Tangerine Dream que l'on a pu remarquer les influences aussi dans "Downwards we Go". "After Dallas" fait très Steve Roach, alors que le court "Shielded Transformer" fait très ambiances de film d'épouvante où la fin du monde arrive avec sa horde de démons affamés. "Wisdom" présente une violente tempête de vents autant sombres que criards et dont les deux tonalités s'affrontent dans un duel tintamarresque. Sont-ce les trompettes des anges annonciateurs d'apocalypse? Toujours est-il qu'on a l'impression de descendre dans le creux de la terre avec des bruits d'une marginalité sonique aussi dérangeante que séduisante. "Wisdom" se déroule en plusieurs phases. Ainsi, si l'impression d'émerger des ténèbres pour se faire caresser par de séduisants vents harmonieux c'est pour replonger dans une spirale, comme un purgatoire, où le tapage renait afin de nous ramener encore plus loin dans les entrailles des noirceurs. Deux courts titres séparent nos oreilles de cette 1ière écoute de “Hagen's Delight”. "Glass Cabinett" est un titre très dérangeant idéal pour un film d'horreurs aux images éprouvantes. C'est sordide à l'os! "A Summer's Funeral" est un superbe titre. Plein de délicatesse malgré son enveloppe mortuaire, le titre offre une suite d'arpèges qui sautillent avec une approche mélodieuse qui se fond à une chorale d'embaumeurs. C'est très bon et assez incitatif pour remettre “Hagen's Delight” en mode écoute. Voilà un très belle surprise! Un album étonnant qui plaira assurément aux amateurs d'une Berlin School des années inimaginables. Here is a splendid surprise that I almost forgot in the chinks of my lap-top. Who is Lost Radiance? It's a band of 4 Russian musicians (Alexander Asimov, Roman Rogov, Roman Zorin and Yuriy Miller) who simmer, together or in solo projects, an EM propelled by lively movement of sequencers or still flooded in dark atmospheres. “Marly” is a 2nd opus which is held far from the dark territories of Sirius Radiance, a Roman Rogov's dark ambient music project. And I have to admit that I was totally seduced by 5 superb movements, the finale is more serene, of sequencers which draw rhythms, and their subtle evolutions, in an electronic universe filled with these magnetizing perfumes of the analog universe. Small butterflies filled with rhythmic tones frolic at the opening of "Marly (Part 1)". A good layer of voices, emanating from the void, gives celestial airs to this rhythm so delicate as the webbed feet of a duckling which discovers its lake by making perfect circles. It's the bass line which precipitates things from the 2nd minute. Its keen palpitations add an always motionless swiftness while a wide band of bluish mist always gives a celestial privilege to this first title of “Marly”. Another lines of sequences, more crackling, gets in at the same moment as our duckling decides to modify the design of its circles. Rich in analog tones and fertile in the reshaping of an always motionless structure, here and all over “Marly” by the way, "Marly (Part 1)" is a very nice invitation to those who discover the universe of the Russian quartet. "Marly (Part 2)" does in very Berlin School with its introduction weaved with layers of vaporous mists which float like the vapors of a dream. A discreet line of arpeggios is undulating with a chant in the movement and electronic effects are chirping in the decor. Quite slowly the fog becomes a harmonious layer which reveals its seductive chant and of which the shadow, more musical, prints its Berliner imprint on "Marly (Part 2)". We can hear pulsations at the door of the two minutes. The rhythm is as smooth as a snake which hypnotizes its prey in an imaginary dance just as our senses have no chance to escape to the charms of this fascinating album of Lost Radiance. "Marly (Part 3)" is clearly the wildest track of “Marly”. The movement of the sequencer sculpts some small minimalist rhythmic loops while a 2nd movement espouses the curves with a light difference in the tone. This rhythmic movement modifies its pace in a mass of hypnotizing fog, firing up a rhythmic melodic which sounds like a derisive chant in a loud and wild rhythmic spiral. Delicious! Airy, "Marly (Part 4)" puts down an alternative movement which oscillates with hypnotic loops. The movement takes a more ethereal tangent in the middle. And as everything remains in movement in “Marly”, some percussive effects feed my ears always starved by these sequences which skip and pound, modifying even their paces, in a universe deprived of mists and of artifices from the synths. "Marly (Part 5)" is quite in contrast with a heavy and lively structure where bring out layers of Tangerine Dream's Jive years. It's a loud, boisterous and surprisingly musical sequencer-based style. My ears are always greedy for a style so heavy and effective at the level of the Mephistophelian effects. "Marly (Part 6)" lays down light arpeggios which ring as a rain finishes its tears in an ambience of melancholy. Others fall and shape a delicious sibylline air, which is as well near of a Halloween (the movie) ritornello than of the eternal light, that a huge layer of angelic voice attracts towards the void. Offered in a downloadable format only, like the Lost Radiance's first album, Upon Us released in 2014, “Marly” is a very good album which is going to seduce the aficionados of an EM exhausted by lively and heavy structures of sequences. The atmospheres and the sound mass is just as much attractive with harmonies which draw their charms as much from the sequencers as the synths. Fans of Berlin School!? To your wallets! Voilà une excellente surprise que j'ai failli oublier dans les interstices de mon portable. Qui est Lost Radiance? C'est un groupe de 4 musiciens russes (Alexander Asimov, Roman Rogov, Roman Zorin et Yuriy Miller) qui mijotent, ensemble ou en projets solos, une MÉ propulsée par de vivants mouvement de séquenceurs ou encore noyée dans des ambiances ténébreuses. “Marly” est un 2ième opus qui se tient loin des territoires sombres de Sirius Radiance, projet de Roman Rogov. Et je dois admettre que j’ai été totalement séduit par 5 superbes mouvements, la finale est plus sereine, de séquenceurs qui dessinent des rythmes, et leurs subtiles évolutions, dans un univers électronique rempli de ces magnétisants parfums de l'univers analogue. Des petits papillons gorgés de tonalités rythmiques folâtrent en ouverture de "Marly (Part 1)". Une nappe de voix, émanant du vide, donne des airs célestes à ce rythme aussi délicat que les pieds palmés d'un canardeau qui découvre son lac en effectuant des cercles parfaits. C'est une ligne de basse qui précipite les choses à partir de la 2ième minute. Ses palpitations frénétiques ajoutent une vélocité toujours stationnaire alors qu'une large bande de brume bleutée donne toujours un privilège céleste à ce premier titre de “Marly”. Une autre ligne de séquences, plus grésillantes, s'invite au même moment que notre caneton décide de modifier le design de ses cercles. Riches en tonalités analogues et fécond dans le remodelage d'une structure toujours immobile, "Marly (Part 1)" est une très belle invitation à ceux qui découvrent l'univers du quatuor russe. "Marly (Part 2)" fait dans le très Berlin School avec son introduction tissée avec des nappes de brumes vaporeuses qui ondoient comme les vapeurs d'un rêve. Une discrète ligne d'arpèges ondulent avec un chant dans le mouvement et des effets électroniques pépient dans le décor. Tout doucement le brouillard devient une nappe harmonique qui dévoile un séduisant chant dont l'ombre, plus musicale, imprime son empreinte Berliner sur "Marly (Part 2)". Des pulsations se font entendre à la porte des deux minutes. Le rythme est aussi coulant qu'un serpent qui hypnotise sa proie dans une danse imaginaire où les sens n'ont aucune chance d'échapper aux charmes de ce fascinant album de Lost Radiance. "Marly (Part 3)" est nettement le titre le plus animé de “Marly”. Le mouvement du séquenceur sculpte des petites boucles rythmiques minimalistes alors qu'un 2ième mouvement épouse les courbes avec une légère différence dans la tonalité. Ce mouvement rythmique modifie sa course dans une masse de brouillard hypnotisant, allumant une rythmique mélodique qui sonne comme un chant moqueur dans une spirale rythmique lourde et effrénée. Délicieux! Plus aéré, "Marly (Part 4)" dépose un mouvement alternatif qui oscille avec des boucles hypnotiques. Le mouvement prend une tangente plus éthérée en mi-parcours. Et comme tout reste en mouvement dans “Marly”, des effets percussifs nourrissent mes oreilles toujours affamées par ces séquences qui sautillent et palpitent, modifiant même leurs cadences dans un univers dénué de brumes et d'artifices des synthés. "Marly (Part 5)" est tout en contraste avec une structure lourde et vive où sortent des nappes à la TD des années Jive. C'est un style sequencer-based bruyant, entraînant et étonnement musical. Mes oreilles sont toujours avides d'un style aussi lourd et efficace au niveau des effets Méphistophéliques. "Marly (Part 6)" dépose des légers arpèges qui tintent comme la pluie achève ses pleurs dans une ambiance de mélancolie. D'autres tombent et façonnent un délicieux chant sibyllin, qui est aussi près d'une ritournelle à la Halloween (le film) que de la lueur éternelle, qu'une énorme nappe de voix angélique attire vers le vide. Offert en format téléchargeable uniquement, comme le premier album de Lost Radiance Upon Us paru en 2014, “Marly” est un très bel album qui va séduire les amateurs d'une MÉ épuisée par de vivantes et lourdes structures de séquences. Les ambiances et la masse sonique est tout autant séduisante avec des harmonies qui puisent leurs charmes autant dans les séquenceurs que les synthés. Fans de Berlin School!? À vos portes-feuilles! Three years after The Room of Plenty, centrozoon releases a series of recordings made during a tour on the American East coast in November 2016. And it's without Tobias Reber that Bernhard Wöstheinrich, on synth and sequencer, and Markus Reuter, on Touch Guitar U, have offered a short series of concerts of an EM more than audacious where the senses have to be in another dimension in order to follow the hazardous paths of “217 XIII”. It's with a series of jerky sequences which crowd in side blows that Markus Reuter's guitar spreads its flavors roaming on a bed of reverberations. The movement of the sequencer exhausts its keys which look for themselves in a heavy electronic envelope where the lamentations of the guitar and the synth are trumpeting like two different species of elephants on the point to merge in a new entity. Illustrated as description? And nevertheless, it's completely corresponding with the universe of centrozoon whom anti-music is at the service of the abstracted music lovers or of a fan of a symphony in fission. More convenient to the effects of synth than guitar, the 1st part of "Farmington High School 1" always evolves in the tumult to reach a point of no return and overturn into a progressive electronic rock around the 11th minute. We fall in a King Crimson ground with a one-armed drummer who tries constantly to thwart the long tortuous soloes of a guitar which grumbles more than sings. My degree of curiosity follows the curve of a long structure full of collapses, but which also hides good moments, where the moods are constantly colorful by hollow breezes, scattered blows of the sequencer and effects of guitar which are clearly more audacious than those of Robert Fripp. And it's all the universe, and the concept, of “217 XIII”. You should not expect to sit down and to dream lazily, nor to think of dancing or of swaying the hips, in front of the 5 segments of “217 XIII”. Everything is a story of experiments from Markus Reuter's Touch Guitar U8. The first 4 minutes of "Farmington High School 2" are a beautiful delight of ambient music. The chopper falls afterward. The atmospheres are dissipated by a tumult of knockings and sequences of which the soles of clogs scatter the nice Mellotron effects. 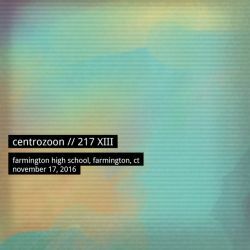 Afterward, a strange homogeneity forms, giving to "Farmington High School 2" a musical aura which makes it the most beautiful title of “217 XIII”. There are good phases of progressive rock of flooded here, just like in "Farmington High School 3" whose evolution crosses light breezes, which make ring some bells and make sing a solitary guitar, in a heavy resounding passage which unravels its fury on a good mid-tempo. "Farmington High School 4" follows this upward curve after an introduction stained of sonic doodles which roll in a rather serene plain. The tension goes up rather easily with the wild imaginings of a six-strings which quietly builds its empire of distortions. The good moments here will please to the fans of a heavy and mortuary music where the friction of tones looks like an out of tune symphony. "Farmington High School 4" is undoubtedly the most disturbing, the most puzzling of the titles on this “217 XIII”. The good moments are always present, although less here, and bring us little by little to accustom us to the sound arsenal of this recording of which the softest boldness of centrozoon is in "Farmington High School Soundcheck". And it's this principle of duality that makes the listening of “217 XIII” always a little less painful. To taste part by part, by beginning with the end, and we let ourselves being cajoled by this universe where the storms arise by of so few things. Trois ans après The Room of Plenty, centrozoon sort une série d'enregistrements effectués lors d'une tournée sur la Côte Est américaine en Novembre 2016. Et c'est sans Tobias Reber que Bernhard Wöstheinrich, aux synthé et séquenceur, et Markus Reuter, à la Touch Guitar U, offraient une courte série de concerts d'une MÉ plus qu'audacieuse où les sens doivent être dans une autre dimension pour suivre les hasardeux parcours de “217 XIII”. C'est avec une série de séquences saccadées qui se bousculent dans des coups latéraux que la guitare de Markus Reuter étend ses parfums errant sur un lit de réverbérations. Le mouvement du séquenceur épuise ses ions qui se cherchent dans une lourde enveloppe électronique où les lamentations de la guitare et du synthé barrissent comme deux différents espèces d'éléphants sur le point de fusionner en une nouvelle entité. Imagé comme description? Et pourtant, c'est tout à fait concordant avec l'univers de centrozoon dont l'anti-musique est au service des amateurs de musique abstraite, de symphonie en fission. Plus propice aux effets de synthé que de guitare, la 1ière partie de "Farmington High School 1" évolue toujours dans le tumulte pour atteindre un point de non-retour et verser dans un rock électronique progressif autour de la 11ième minute. On tombe dans du King Crimson avec un batteur manchot qui tente constamment de déjouer les longs solos tortueux d'une guitare qui râle plus qu'elle ne chante. Mon degré de curiosité suit la courbe d'une longue structure pleine de débâcles, mais qui cache de bons moments, où les ambiances sont constamment bigarrées par des brises caverneuses, des coups éparpillés du séquenceur et des effets de guitare qui sont nettement plus audacieux que ceux de Robert Fripp. Et c'est tout l'univers, et le concept, de “217 XIII”. Il ne faut pas s'attendre à s'assoir et rêver oisivement, ni penser danser ou se déhancher, devant les 5 volets de “217 XIII”. Tout est histoire d'expérimentations de la Touch Guitar U8 de Markus Reuter. Les 4 premières minutes de "Farmington High School 2" sont un beau délice de musique d'ambiances. Le couperet tombe par la suite. Les ambiances sont dissipées par un tumulte de cognements et de séquences dont les semelles de sabots éparpillent de beaux effets de Mellotron. Par la suite, une étrange homogénéité se forme, rendant à "Farmington High School 2 une aura musicale qui en fait le plus beau titre de “217 XIII”. Il y a de bonnes phases de rock progressif noyés ici, tout comme dans "Farmington High School 3" dont l'évolution passe de légères brises, qui font tinter des clochettes et chanter une guitare solitaire, à un lourd passage tonitruant qui effiloche sa rage sur un bon mid-tempo. "Farmington High School 4" suit cette courbe ascensionnelle après une introduction barbouillée de gribouillis sonique qui roulent dans une plaine assez sereine. La tension monte assez facilement avec les élucubrations d'une six-cordes qui tranquillement construit son empire de distorsions. Les bons moments ici plairont aux fans d'une musique lourde et mortuaire où la zizanie des tons ressemble à une symphonie désaccordée. "Farmington High School 4" est sans aucun doute le plus dérangeant, le plus déroutant des titres sur ce “217 XIII”. Les bons moments sont toujours présents, quoique moins ici, et nous amènent peu à peu à nous accoutumer à l'arsenal sonique de cet enregistrement dont le "Farmington High School Soundcheck" est la plus douce audace de centrozoon. Et c'est ce principe de dualité qui rend l'écoute de “217 XIII” toujours un peu moins pénible. À déguster partie par partie, en commençant par la fin, et on se laisse amadouer par cet univers où les tempêtes naissent de si peu de choses. Quite impressive this Andy Pickford! Since his comeback in 2015, he made 4 albums with Binar as well as a series of 5 EP, on the bases of the adagio, and finally 4 solo albums among which 2 of an exceptional length of more than 3 hours, though this “Shadow at the Gate” eyes the 4 hours. Too much you will tell me? No, if we are a fan of the AP phenomenon! Old stuff recycled? Absolutely not! And I don't know how he does, but his music acts like a huge ear-worm which makes us simply addicting for each of the 71 minutes that last the 3 main acts of the sonic saga “Shadow at the Gate”. 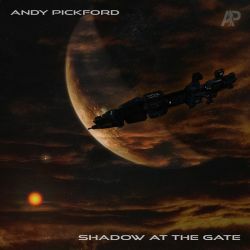 A little as Harmonics in the Silence, “Shadow at the Gate” proposes an immense sound collage rich in tones and in rather dark ambiences on which Andy Pickford grafts rhythms which are situated between a soft Electronica and a more melodious side of the England School with airs as catchy as the rhythms. And the contagion is also crawling as in Harmonics in the Silence. And even more! That begins with an explosion of sounds. Vaporous fragments and nebulous mists are dragging there. We even hear murmurs and layers of choirs which float above the destruction of the sound elements. Little by little, our sense of hearing perceives a wave quavering while a very nostalgic piano spreads a bed of romance that an Elfish voice surrounds of charm. In the background, the quivering wave becomes a jerky movement. Little by little, the mosaic of "Shadow at the Gate (Pieces I-V)" takes shape. On a slightly inviting rhythm, the strummed melody circulates with effects of synth which hoot in a quirky and in a sharpy voice. Heavy, slow and finally lively, this first part of "Shadow at the Gate (Pieces I-V)" takes the shape of a good down-tempo which mobilizes our senses with a minimalist approach which leans the 8 minutes. The piano runs out of this sound mass to evaporate in one of these bridges which bind the diverse forms of rhythms of this work as impressive as imposing. Cosmic and supernatural effects dress these sound bridges of a textural wealth which feed this madness of the sounds' eaters whom are, at the base, the lovers of EM. Of this 2nd phonic ashes rise a series of circular sequences of which crystalline tints get melt to some distant riffs of guitar. Straightaway, I insist on writing that, Andy Pickford reveals here his major component, his breathtaking hymn of “Shadow at the Gate”. Ghostly torsades of synth, slow and lively percussions as well as a guitar which throws the gloom as our soul throws of some lest to survive, this wonderful 2nd part of "Shadow at the Gate (Pieces I-V)" is going to obsess you. Tomorrow the day after and even farther to have experienced it. One would say a marriage between Darshan Ambient and AP, so much the mesmerizing melody of the guitar, and its perpetual addicting buckles, cry on a cosmic bed and on a rhythm to rub our belly on that of our loved one. A wonderful cosmic slow dance which lasts beyond the 10 minutes and which we would want still endless. This stage stretches its melody which melts into another bridge of tones and of which the ethereal atmospheres bring us towards a more lively electronic structure. On a hopping rhythm, this 3rd piece of "Shadow at the Gate (Pieces I-V)" is fed by sound elements which circulate as in a gallery of starving specters. AP masters this structure with so many nuances in the tones, avoiding the traps of the minimalist redundancy of the structures which are a little less magnetizing. And it's the strength of Andy Pickford here; the art to measure well and to understand well which moment will be the most attractive for his fans. I would say that the 2nd attraction takes out of a intriguing sound corridor around the 45th minute. On a slow circular rhythm well dosed by good effects of percussions, the sequences shine and sing a melody as well kiss-curl as that of the 2nd part. Shorter, this passage empties its feelings in another soundscape filled with sibylline winds before a solid rhythm machine-gunned by an acid approach ends "Shadow at the Gate (Pieces I-V)". Embracing the same rules, but in a very thick weaved tonal envelope and which lets filter few oxygen, "Shadow at the Gate (Pieces VI-X)" evolves between its 5 phases with a crescendo approach always so charmingly. The first structure of rhythm gets up after the 4 minutes and its approach is very cinematographic, that reminds me Geoff Downes in his immortal New Dance Orchestra, with a wall of orchestrations flooded in a very compact sound mass. It's very intense! Another little jewel? We climb until the 16th minute with a heavy slow dance tempo decorated of celestial voices and of azure winds. The electronic effects are always so intense and relegate this bewitching structure in the background, but the charm remains formidable. The 3rd phase of rhythm is in pure England School signed Pickford. The melody is forged on an anvil while the structure of rhythm is sculptured in a meshing of sequences, its stroboscopic shadows, and percussions which skip such as a hip-hop which eats the asphalt of its rebel feet. The whole gets drown, with a fascinating correctness in the timing, into another delicious phase of atmospheres. We get our breath back there because from the 45th minute, "Shadow at the Gate (Pieces VI-X)" offers another jewel of slowly stroboscopic electronic rhythm which is so stuffed in sounds and in tones that it has given me the taste to listen to the hyper attractive and melodious Mike Oldfield's The Song of a Distant Earth (what an album this one is!). The last electronic waltz of "Shadow at the Gate (Pieces VI-X)" ends by a similar approach but with more vigor in the rhythm with a strangely Oldfield guitar in it. To present 2 so solid hours is quite a whole tour de force, so imagine my unbelieving ears when I put "Shadow at the Gate (Pieces XI-XV)" in my Pioneer Elite N50! I won’t go in all the details because the way it is sounds just like to two other tracks, but the superb fluty melody on a slow tempo that much enigmatic drags us into the mazes of EM's enchantments. The synth extirpates a melody more synthesized than the flute which dances in a soundtrack so intense as a heartbreak which goes and comes. The second structure is a tribal intergalactic rave-up always so fed than all these ambient phases which tie-up these rhythmic gyrating crossroads, whereas the third part offers this fabulous spectral and oneiric mixture which encircles the majority of the melodies of “Shadow at the Gate”. The crescendo is very poignant here! After a kind of Acid-House structure (may I have to remind that I am not such a connoisseur in Electronica), "Shadow at the Gate (Pieces XI-XV)" loops the loop with one heavy mid-tempo as devastating as lively. And as if it wasn't enough, Andy Pickford offers a title brought out from nowhere in "Drone Alone"; a long music piece (well kind of...) served on a rather gloomy mood. The rhythm is soft and follows a rather evolutionary bend at the level of its intensity while the fragments of melodies which are grafted here and there go and come with a very reserved approach. The synth sounds like guitar, or vice versa, which shouts in a night jammed by a heavy phonic veil filled with a good dose of emotion. It’s a little bit difficult to survives the 3 monuments of “Shadow at the Gate”, but the very melancholic approach of "Drone Alone" succeeds to shine in this work simply colossal of Andy Pickford. Tout de même assez impressionnant ce Andy Pickford! Depuis son retour en 2015, il a réalisé 4 albums avec Binar ainsi qu'une série de 5 EP, sur les bases de l'adagio, et finalement 4 albums solos dont 2 d'une durée exceptionnelle de plus de 3 heures, même que ce “Shadow at the Gate” lorgne les 4 heures. Trop vous me direz? Non si on est fan du phénomène AP! Des vieux trucs recyclés? Absolument pas! Et je ne sais pas comment il fait, mais sa musique agit comme un immense ver d'oreille qui nous rend tout simplement addictif pour chacune des 71 minutes que dure les 3 principaux actes de la saga sonique “Shadow at the Gate”. Un peu comme Harmonics in the Silence, “Shadow at the Gate” propose un immense collage sonique riche en tons et en ambiances assez sombres auquel Andy Pickford greffe des rythmes, qui se situent entre une douce Électronica et le côté plus mélodieux de l'England School avec des airs aussi accrocheurs que les rythmes. Et la contagion est aussi rampante que dans Harmonics in the Silence. Et même plus! Ça commence par une explosion de sons. Des fragments vaporeux et des brumes nébuleuses traînent. On entend même des murmures et des nappes de chœurs qui flottent au-dessus la désintégration des éléments sonores. Peu à peu, notre ouïe perçoit une onde chevroter alors qu'un piano très nostalgique étend un lit de romance qu'une voix Elfique entoure d'ensorcellement. En arrière-plan, l'onde tremblotante devient un mouvement saccadé. Peu à peu, la mosaïque de "Shadow at the Gate (Pieces I-V)" prend forme. Sur un rythme légèrement invitant, la mélodie pianotée circule avec des effets de synthé qui ululent d'une voix biscornue et acuité. Lourde, lente et finalement entraînante, cette première portion de “Shadow at the Gate” prend la forme d'un bon down-tempo qui mobilise nos sens avec une approche minimaliste qui accote les 8 minutes. Le piano s'extirpe de cette masse sonique pour s'évaporer dans un de ces ponts qui relient les diverses formes de rythmes de cette œuvre aussi impressionnante qu'imposante. Effets sonores cosmiques et surnaturels habillent ces passerelles sonores d'une richesse texturale qui alimentent cette folie des consommateurs de sons que sont, à la base, les amants de la MÉ. De ces 2ième cendres phoniques s'élèvent une série de séquences circulaires dont les teintes cristallines se fondent à de lointains riffs de guitare. D'emblée j'insiste pour écrire qu'Andy Pickford dévoile ici sa pièce maitresse, son hymne à couper le souffle de “Shadow at the Gate”. Torsades de synthé fantomatiques, percussions lentes et entraînantes et une guitare qui jette le spleen comme notre âme jette du lest pour survivre, cette merveilleuse 2ième partie de "Shadow at the Gate (Pieces I-V)" va vous obséder demain, après-demain et même plus loin pour en avoir fait l'expérience. On dirait un mariage entre Darshan Ambient et AP, tant la mélodie envoûtante de la guitare, et ses sempiternels boucles addictives, pleurent sur un lit cosmique et un rythme à se frotter le ventre sur celui de notre douce moitié. Un superbe slow cosmique qui dure au-delà des 10 minutes et que l'on voudrait encore éternel. Cette étape étire sa mélodie qui se fond à un autre pont de tons et dont les ambiances éthérées nous amènent vers une structure électronique plus vivante. Sur un rythme sautillant, ce 3ième segment de "Shadow at the Gate (Pieces I-V)" est nourri d'éléments soniques qui circulent comme dans une galerie de spectres affamés. AP maîtrise cette structure avec des nuances dans les tons, évitant les pièges de la redondance des structures minimaliste qui sont un peu moins magnétisantes. Et c'est la force d'Andy Pickford ici; l'art de bien doser et de bien comprendre quel moment sera le plus attirant pour ses fans. Je dirais que le 2ième coup de cœur sort d'un intrigant corridor sonique autour de la 45ième minute. Sur un lent rythme circulaire dosé par de bons effets de percussions, des séquences miroitent et chantent une mélodie aussi accroche-cœur que celle de la 2ième partie. Plus court, ce passage vide ses émotions dans un autre paysage sonique bourré de vents sibyllins avant qu'un solide rythme mitraillé par une approche acide termine "Shadow at the Gate (Pieces I-V)". Épousant les mêmes préceptes, mais dans une enveloppe tonale tissée très drue et qui laisse filtrer peu d'oxygène, "Shadow at the Gate (Pieces VI-X)" évolue entre ses 5 phases avec une approche toujours aussi délicieusement en crescendo. La 1ière structure de rythme se lève après les 4 minutes et son approche est très cinématographique, ça me fait penser à Geoff Downes dans son immortel New Dance Orchestra, avec une muraille d'orchestrations noyée dans une masse sonique très compacte. C'est très intense! Un autre petit bijou? On grimpe jusqu'à la 16ième minute avec un lourd slow tempo orné de voix célestes et de vents azurés. Les effets électroniques sont toujours aussi intenses et relèguent cette structure ensorcelante en arrière-plan, mais le charme reste redoutable. La 3ième phase de rythme est dans le pur England School signé Pickford. La mélodie est forgée sur une enclume alors que la structure de rythme est sculptée dans un maillage de séquences, aux ombres stroboscopiques, et de percussions qui sautillent comme un hip-hop qui mange l'asphalte de ses pieds rebelles. Le tout se noie, avec une fascinante justesse dans le timing, dans une autre délicieuse phases d'ambiances. On y reprend notre souffle car dès la 45ième minute "Shadow at the Gate (Pieces VI-X)" offre un autre bijou de rythme électronique lentement stroboscopique tellement farci en sons et en tons que ça m'a refilé le goût d'entendre l'hyper séduisant et mélodieux The Song of a Distant Earth de Mike Oldfield. La dernière valse électronique de "Shadow at the Gate (Pieces VI-X)" se termine par une approche similaire mais avec plus de vigueur dans le rythme et une guitare étonnamment Oldfield. Présenter 2 heures aussi solides est tout un tour de force, alors imaginez mes oreilles incrédules lorsque j'ai mis "Shadow at the Gate (Pieces XI-XV)" dans mon Pioneer Elite N50! Je n'irai pas dans tous les détails, mais la superbe mélodie flûtée sur un slow tempo aussi énigmatique que cette mélodie nous entraîne dans les labyrinthes d'enchantement de la MÉ. Le synthé extirpe une mélodie plus synthétisée que la flûte qui danse dans une trame sonore aussi intense qu'un chagrin d'amour qui va et vient. La 2ième structure est une fiesta tribale intergalactique toujours aussi nourrie que toutes ces phases d'ambiances qui relient ces carrefours giratoires rythmiques, alors que la 3ième offre ce fabuleux mélange spectral et onirique qui cerne la majorité des mélodies de “Shadow at the Gate”. Le crescendo est très poignant ici. 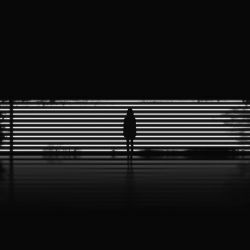 Après une structure du genre Acid-House (je vous rappelle que je ne suis pas un connaisseur en Électronica), "Shadow at the Gate (Pieces XI-XV)" boucle la boucle avec un lourd mid-tempo aussi dévastateur qu'entraînant. Et comme si ce n'était pas assez, Andy Pickford offre un titre sorti de nulle part en "Drone Alone", un long titre servi sur une ambiance un peu ténébreuse. Le rythme est doux et suit une courbe assez évolutive au niveau de son intensité alors que les bribes de mélodies qui se greffent vont et viennent avec une approche très réservée. Le synthé sonne comme une guitare, ou vice-versa, qui pleure dans une nuit encombrée d'un lourd voile phonique imprégné d'une bonne dose d'émotion. C'est un peu difficile de survivre aux 3 monuments de “Shadow at the Gate”, mais l'approche très mélancolique de "Drone Alone" parvient à rayonner dans cette œuvre tout simplement colossal d'Andy Pickford. Spotted Peccary widens its horizons with albums, a little more complex like the one of Concrete music from Mystified (Morning City) or this very ambient album from Chris Russell, “Labyrinth”, offer only in a downloadable format on SP Bandcamp. This is the very first album from the American musician, who does in the deep relaxation albums, on the American label. I have already heard the music of Chris Russell, who has a dozen albums of made, with Phillip Wilkerson on the very ambient album Vague Traces, also released on Spotted Peccary in 2014. And the least that we can say, Chris Russell is more than comfortable with long winged structures which move in slow motion in a musical universe centered on the quest of oneself. It's moreover in these terms that he qualifies the music of “Labyrinth”; a soundtrack to circling to the center of oneself! A slow layer arises from the void in order to float over our head. Between perfumes of serenity and those a little more deeply touching from the calm drones, "The Beginnings" undertakes this journey inside our labyrinth of emotions. Two to three synth lines extend like ink clouds over a blotting paper, releasing the beginnings of an opposition, of a contrast, between blue and black and whose fusion depicts the depth of our feelings. Sometimes sibylline, sometimes dreamy and sometimes moving, the music of "The Beginnings" acts as a front door towards a session of Meta meditation, provided that we accept Chris Russell's invitation. Because here the ambient music is very Zen. If layers of a darker, of a deeper nature, like those with scents of organ in "Life's Journey", or more occult, like in the long "Lunation", are springing here and there, the music of “Labyrinth” inhales a peace of mind which would have made the delights of the lovers of the New Age in the 80' and 90's. Especially when we add to it the crackling of a paradisiac fire, "Dream Fragments", which dances under our eyes and sparkles in our ears on an unaccompanied evening on the edge of a lake. With a little of imagination, and a wish to feel it, we can even inhale the smell of the water. "In the Maze" is an ode to serenity with these layers built around translucent tints which espouse a course of clouds under azure winds. If there are essences of Steve Roach's desert atmospheres all over “Labyrinth”, it's in titles such as "In the Maze" and very quiet "The Vision" whom they are the most noticeable. Not really my genre, I let myself embrace the void with the music of “Labyrinth”. If I was never capable of embracing it, I, on the other hand, have discovered an artist as seducing as Steve Roach when he carries me near the doors to the sleep. It's in my iPod, section night music! Spotted Peccary élargit ses horizons en avec des albums un peu plus complexes (Mystified et Morning City) ou très ambiant comme ce tout premier opus de Chris Russell sur la nouvelle division d'albums en format téléchargeable du label américain. J'ai déjà entendu la musique de Chris Russell, qui a une douzaine d'albums au compteur, avec Phillip Wilkerson sur l'album très ambiant Vague Traces, aussi paru sur Spotted Peccary en 2014. 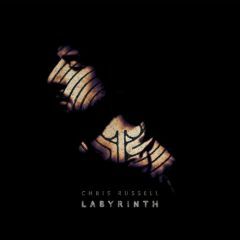 Et pour le moins que l'on puisse dire, Chris Russell est plus qu'à l'aise avec de longues structures ailées qui se déplacent au ralenti dans un univers musical axé sur la quête de soi-même. C'est d'ailleurs en ces termes qu’il qualifie la musique de “Labyrinth”; une bande sonore pour circuler au centre de soi-même! Une lente nappe s'extirpe du vide afin de flotter au-dessus de notre tête. Entre des parfums de sérénité et ceux un peu plus bouleversant de bourdonnements placides, "The Beginnings" entreprend ce voyage à l'intérieur de notre labyrinthe d'émotions. Deux à trois lignes de synthé s'étendent comme des nuages d'encre sur un papier buvard, dégageant la prémices d'une opposition, d'un contraste, entre le bleu et le noir et dont la fusion dépeint la profondeur de nos émotions. Tantôt sibylline, tantôt rêveuse et parfois émouvante, la musique de "The Beginnings" agit comme une porte d'entrée vers une séance de Meta méditation, à condition que l'on accepte l'invitation de Chris Russell. Car ici la musique d'ambiances est très Zen. Si des nappes d'une nature plus sombre, plus profonde, comme celles aux odeurs d'orgue dans "Life's Journey" ou plus occultes, comme dans le long "Lunation", jaillissent ici et là, la musique de “Labyrinth” respire une quiétude qui aurait fait les délices des amants du New Age dans les années 80-90. Surtout lorsque l'on y ajoute les crépitements d'un feu paradisiaque, "Dream Fragments", qui danse sous nos yeux et pétille dans nos oreilles par une soirée en solitaire sur le bord d'un lac. Avec un peu d’imagination, et de vouloir évidemment, on peut même respirer l'odeur de l'eau. "In the Maze" est une ode à la sérénité avec ces nappes aux teintes translucides qui épousent une course des nuages sous des vents azurés. S'il y a des essences des ambiances à la Steve Roach tout partout autour de “Labyrinth”, c'est dans des titres tel que "In the Maze" et le très tranquille "The Vision" qu'ils ressortent le plus…. Pas vraiment dans mon genre, je me suis laissé aller dans le vide avec la musique de “Labyrinth”. Si je n'ai jamais été capable d'embrasser ce vide, j'ai par contre découvert un artiste aussi séduisant que Steve Roach lorsqu'il me porte aux portes du sommeil. C'est dans mon iPod, section musique de nuit! As prolific as a brook which draws its inspiration down from a fall, Ron Charron delivers us a 2nd opus, the 9th in all, of Sequential Dreams some 3 months after The Exodus Wave. 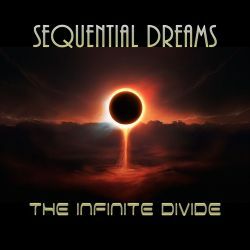 And contrary to this album, “The Infinite Divide” proposes a less rock approach with 10 titles which travel between the various periods of Sequential Dreams' main source of inspiration: Tangerine Dream. "A Geometry of Shadows" opens “The Infinite Divide” with strength! A line of bass sequences runs like a train on a rail of wadding. Little wings of metal spin all around this delicious oscillatory movement that Ron Charron decorates with riffs under the forms of very TD's layers, of reverberating effects and of delicate fluty melodies. Whereas the percussions plough a cynical weightiness, a guitar, not the one of Bernhard Beibl, grafts harmonious solos of which the tones are situated between Edgar and David Gilmour. More than a simple pastiche of the sound armada of TD, "A Geometry of Shadows" is a good fusion between Pink Floyd and the gang of Froese, Franke and Baumann in an approach which transcends the works of Sequential Dreams up to here. In fact, “The Infinite Divide” is a turning point, a bend in the career of this worldwide band, Chris Peare participated to the elaboration of "A Geometry of Shadows" while Arend Westra contributed to "Breath of Life", with a hyper well-done production and where all the instruments play a very precise role in a collection of titles inspired by the 1000 perfumes of Tangerine Dream and some of Pink Floyd. And even if the line is sometimes thin between EM and Prog music, the Berlin School style, all era reunited, shines here. Inspired from Edgar Froese's rhythms, "Angels at Hades Gates" is a nice combination between the Stuntman and the Beyond the Storm years. The blend between Ron Charron' electric six-strings and his synths is done judiciously, as well as this transition between Macula Transfer and Stratosfear. The rhythm is rather lively and gallops without stress in a beautiful sonic valley molded by nice synth effects and dramatic pads. "Breath of Life" is a pretty cool ballad which floats between clouds of blue mist and some slightly too cute sequences. Sometimes perched on the tears of a plaintive guitar, on the sighs of synth mist or in an enjoyable angelic voice, the seraphic melody travels on the delicate upward rhythm of a movement of sequences which will squeeze a cloud filled of water. It's nice to hear! After an ambient introduction a la Rick Wright in Wish You Were Here, "Dark Energy" proposes a galloping rhythm which slips into a splendid structure of complex rhythm fed by these Chris Franke's hyperactive and radioactive sequences. The guitar is judiciously inserted here. "Eternity in a Moment" bears well its title name. It's a Rockoon kind of track! I listened to twice, it was enough! Set apart this little faux-pas, according to my ears, the rest of “The Infinite Divide” is simply delectable. Built a little in the same pattern as "Dark Energy", "In Search of Forever" plunges us straight away into the universe of This Park is Mine. The percussions and the sequences are well crafted while the dramatic effects, the riffs of an acoustic guitar and of an electric six-strings form a surprising symbiosis which flows with fluidity. And it's there that I notice the beautiful artistic maturity which Ron Charron shows here. Previously, all these ingredients had a little of difficulty in merging their directions, as rhythmic than harmonious. Here, the exchange between the phases of rhythms and those of the melodies flow pleasantly into a heavy decoration, into a sound decoration full of emotion or of fury. Take the ballad of "Glittering C-Beams" as example, but the furious "The Deconstruction of Falling Stars" stands to my words strongly. As well as the protean and evolutionary structure of "The Einstein-Rosen Bridge" where, in a ferocious rock, are hide beautiful moments of ethereal ambiences. "Distant Sunrise" closes brilliantly what I consider like the best opus of Sequential Dreams. I like to imagine a Ron Charron, the soul very nostalgic, strolling on the carpet of his keyboard the eyes full of hope for a better world and for his personal path. Yes, my friends and readers, “The Infinite Divide” is a very good album of EM armored to the infinity of the essences of Tangerine Dream. I know that there is a lot of those out there, but there is always one who stands out, like this worldwide project of Ron Charron! Aussi prolifique qu'un ruisseau qui puise son inspiration du haut d'une chute, Ron Charron nous livre un 2ième opus, le 9ième en tout, de Sequential Dreams quelque 3 mois après The Exodus Wave. Et contrairement à cet album, “The Infinite Divide” propose une approche moins rock avec une 10zaine de titres qui voyagent entre les différentes périodes de la principale source d'inspiration de Sequential Dreams; Tangerine Dream. "A Geometry of Shadows" ouvre “The Infinite Divide” avec force. Une ligne de séquences basses roule comme un train sur un rail de ouate. Des élytres de métal virevoltent tout autour du délicieux mouvement oscillatoire que Ron Charron décore de riffs sous formes de nappes très TD, d'effets réverbérant et de délicates mélodies flûtées. Tandis que les percussions labourent une pesanteur cynique, une guitare, non il ne s'agit pas de Bernhard Beibl, greffe des solos harmoniques dont les tonalités se situent entre Edgar et David Gilmour. Plus qu'un simple pastiche de l'armada sonique de TD, "A Geometry of Shadows" est une belle fusion entre du Pink Floyd et le gang à Froese, Franke et Baumann dans une approche qui transcende les œuvres de Sequential Dreams jusqu'ici. En fait, “The Infinite Divide” marque un tournant, un virage dans la carrière de ce band planétaire, Chris Peare a participé à l’élaboration de "A Geometry of Shadows" alors que Arend Westra a participé à "Breath of Life", avec une production hyper soignée et où tous les instruments jouent un rôle bien précis dans une collection de titres inspirée des 1000 parfums de Tangerine Dream et un peu de Pink Floyd. Et même si la ligne est parfois mince entre l'électronique et le progressif, le style Berlin School, toutes périodes confondues, rayonne ici. Inspiré des rythmes d'Edgar Froese, "Angels at Hades Gates" est un beau mélange entre les années Stuntman et Beyond The Storm. L'amalgame entre la six-cordes électrique de Ron Charron et ses synthés est très bien réussi, de même que cette transition entre Macula Transfer et Stratosfear. Le rythme est assez vivant et galope sans stress dans une belle vallée sonique moulée par de bons effets de synthé. "Breath of Life" est une belle ballade qui flotte entre des nuages de brume bleue et des séquences un peu trop mignonnes. Tantôt juchée sur les larmes d'une guitare plaintive, sur les soupirs de brume du synthé ou dans une suave voix angélique, la séraphique mélodie voyage sur le délicat rythme ascensionnel d'un mouvement de séquences à tordre les nuages gorgés d'eau. C'est une belle ballade! Après une introduction d'ambiances à la Wish You Were Here de Rick Wright, "Dark Energy" propose un rythme galopant qui dérape en une superbe structure de rythme complexe nourrie de ces séquences hyperactives et radioactives de Chris Franke. La guitare est judicieusement insérée ici. "Eternity in a Moment" porte bien son titre. C'est du rock à la Rockoon! J'ai écouté deux fois, c'était assez! Mis à part ce petit faux-pas, selon mes oreilles, le reste de “The Infinite Divide” est tout à fait délectable. Construit un peu dans le même moule que "Dark Energy", "In Search of Forever" nous plonge dans l'univers de This Park is Mine. Les percussions et les séquences sont bien rodées alors que les effets dramatiques, les riffs d'une guitare acoustique et la six-corde forment une étonnante symbiose qui coule avec une fluidité. Et c'est là que je remarque la belle maturité artistique que Ron Charron affiche ici. Auparavant, tous ces ingrédients avaient un peu de difficulté à fusionner leurs directions, tant rythmiques qu'harmoniques. Ici, l'échange entre les phases de rythme et celles des mélodies coulent agréablement dans un décor lourd, dans un décor sonique chargé d'émotion ou de rage. On pourrait prendre la ballade "Glittering C-Beams" pour appuyer mes écrits mais le trop furieux "The Deconstruction of Falling Stars" est un exemple typique, de même que la structure protéiforme et évolutive de "The Einstein-Rosen Bridge" où, dans du rock féroce, se cachent de beaux moments d'ambiances éthérées. "Distant Sunrise" clôture avec brio ce que je considère comme le meilleur opus de Sequential Dreams. Je me plais à imaginer un Ron Charron, l'âme très nostalgique, fouler le tapis de son clavier les yeux plein de d'espoir pour un monde meilleur et pour son chemin personnel. Oui mes amis, “The Infinite Divide” est un bel album de MÉ blindé jusqu'à l'infini des essences de Tangerine Dream. Je sais qu'il y en a beaucoup, mais il y en a toujours qui sortent du lot comme le band planétaire à Ron Charron!